Take a moment to consider how much time you spend indoors. Even if you make it a priority to get outside for a few hours every day, you’re still inside the majority of the time. This means you are forced to cope with common indoor air pollutants. It’s more of a challenge if you happen to be one of the 25 million people with asthma. Keep reading as we dive into some of the common pollutants and what you can do improve indoor air quality in your home. Are there any smokers in your household? If so, then it’s good to have a refresher on secondhand smoke. This serious pollutant can worsen symptoms for those with asthma, increase the risk of ear infections in children, and increases the risk of Sudden Infant Death Syndrome. What’s the best way to avoid secondhand smoke? We recommend that you ask any family members to smoke outside. In 2018, radon is identified as the second leading cause of lung cancer. Most homeowners don’t realize that radon enters a residence through cracks and other improperly sealed openings. If you are looking to buy or sell a house anytime soon, be sure to get a radon inspection. This indoor air pollutant is difficult to detect by human senses. A colorless, odorless gas, carbon monoxide interferes with oxygen delivery throughout the body. Even minimal levels of the gas cause painful headaches, dizziness, weakness, and nausea. Be aware that toxic amounts of carbon monoxide can lead to death. Nitrous dioxide is another colorless and odorless gas. However, as opposed to carbon monoxide, this gas tends to cause eye, nose and throat irritation, shortness of breath, as well as an increased risk for respiratory infections. There’s no question that the aforementioned pollutants pose serious health threats to humans. Don’t forget about other less dangerous ones such as allergens, pet dander, dust, dirt, etc. These pollutants can get into your home’s ventilation system and prevent that HVAC system from functioning the way it should. With warmer weather approaching, now is the time to do a quick checkup of your system. Allegiance Heating & Cooling has been keeping Mokena residents comfortable for nearly two decades. We have plenty of industry experience, but especially when it comes to improving residents’ indoor air quality. Have you or other family members been sneezing a lot recently? Do your allergies seem worse this season? A call to our HVAC repair could go a long way. You can count on us to assess your current heating and cooling situation before offering any recommendations. Whether you need basic HVAC service or a complete system overhaul, Allegiance gets the job done right the first time. You can feel at ease knowing we always strive to obtain the best pricing on materials and equipment. 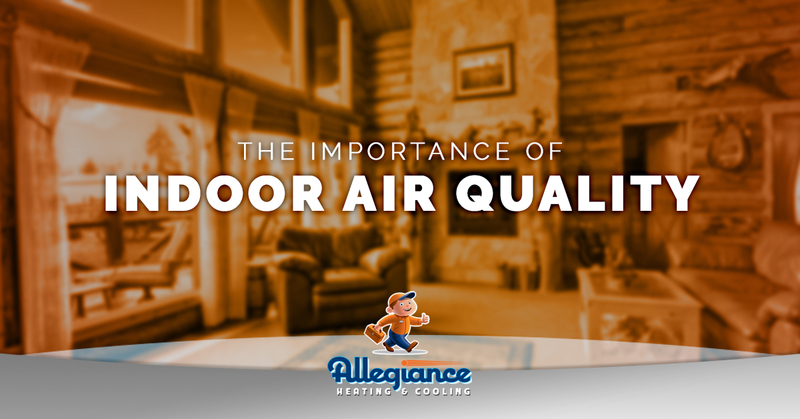 Start improving your home’s indoor air quality. Come to Allegiance for all of your HVAC needs, from AC repair and heating repair to generator repair and more.